There is really nothing new, barefooting-wise, here, but it is good reminder of his research into barefoot running. One thing he mentioned: he only runs barefoot, and wears shoes the rest of the time. Maybe he ought to do a bit of research on barefoot walking, and just how that differs from, and has advantages over, shod walking. In this comment, Beach Bum mentions an article he read in the late 70s about “Foxy Feet”, a barefoot sandal from back then. I’ve managed to dig up the story. Here are three newspaper articles that all seem to be based (though with different details) on an original AP news story. ABSECON, N.J. (AP) — The sign may say “no bare feet,” but if you’re wearing “Foxy Feet,” they’ll never know. Carol Luft, 30, of Absecon has come up with a new gimmick for bare feet that makes them look like they’re wearing sandals. Foxy Feet is an embroidered decoration for the top of the foot. It has no sole but slips around the ankle and hooks over the second toe. Mrs. Luft, who enjoys needlepoint and crocheting, invented Foxy Feet to give her own feet some decoration. Friends recently began placing orders and Mrs. Luft was in business. The sign may say “no bare feet,” but if you’re wearing “Foxy Feet,” they’ll never know. 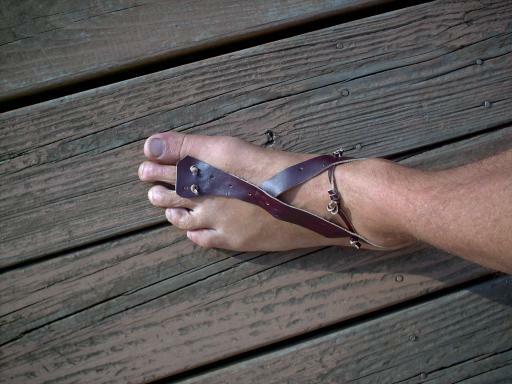 Carol Luft, of Absecon, N.J. has come up with a new gimmick for bare feet that makes it look as if they’re wearing sandals. Foxy Feet is an embroidered decoration for the top of the foot. It has no sole but slips around the ankle and hooks over the second toe. Mrs. Luft’s idea has gotten off on the right foot — stores in New York, New Jersey, Florida and California are stocking htem. To take care of the 26,000 orders she has already gotten, Mrs. Luft is now having Foxy Feet handmade in Haiti. That looks like some pretty hefty demand, and suggests that bare feet really were pretty popular. Until the shoe police managed to stamp them out, of course. You heard that right. Starting next Friday, Austin’s libraries will begin enforcing a dress code that prohibits ball caps, sunglasses and hoodies. You’re asking why. It’s the same reason given for about everything else that goes down these days: keeping you safe. Hey, I’m kept so safe these days that I’m almost afraid to leave the house. The city’s library system has put up bumper sticker-style signs at all of its 21 branches, the history center and its Recycled Reads bookstore on Burnet Road. 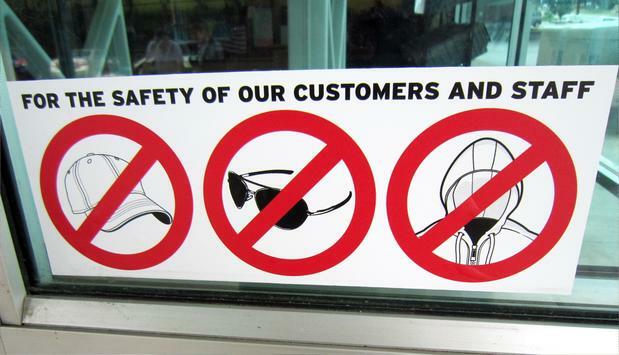 These signs show international “no” signs over illustrations of ball caps, sunglasses and hoodies. The library came up with the rule so that customers can’t hide their faces, said Toni Grasso, the libraries’ administrative manager in the office of programs and partnerships. Do you think this might be overkill? Do they really think this will fix anything (particularly since, from the story, there isn’t much broken?). But it is just another example of library authoritarian over-reach. Appropriate clothing is required – Wearing apparel that obscures or conceals the face, including but not limited to hoodies, caps, hats, sunglasses. Notice anything? That line is gone. I guess bare feet are now OK. I do wonder if they won’t try to still exclude bare feet as not “Appropriate Clothing.” Anybody in Austin was to test it? 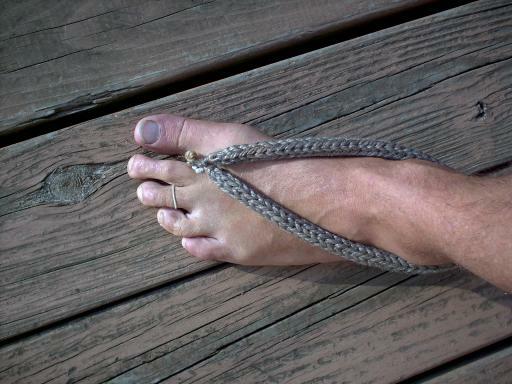 Barefoot sandals are a way that barefooters sometimes use to look like they are shod while still maintaining sole-to-ground contact. In other words, they are used to try to foil the shoe police. For me, at least, that contact with the ground is what provides me with the main sensory input that keeps my proprioception working. It is also the thing that allows me to walk in a way that does not hurt my feet and knees and back (a benefit many other barefooters have also realized). 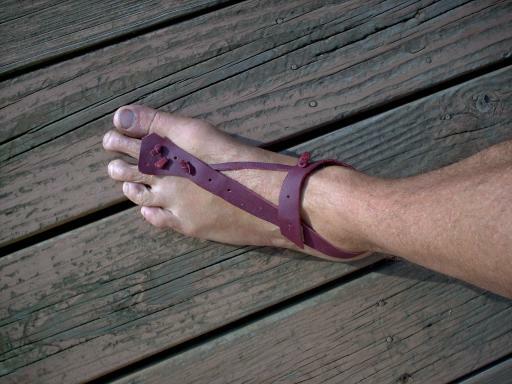 Barefoot sandals can also be used as jewelry or decoration for the feet. Most barefoot sandals that you can buy are aimed more at women. You can see some women’s vendors and styles here, here, and here. (Note: this is not any particular endorsement of these particular sites; they are just some of the first that came up on Google.) There is also a page on barefoot sandals that lists quite a few vendors on the website of the Barefoot Hikers of PA (NJ-DE-MD). There aren’t a whole lot available for men, though I did find this site. You’ll note that most of these are really aimed more at decoration that as fooling personnel at a store or restaurant who are intent on keeping out a barefooter (usually for misguided and mythical reasons). Way back when I just made my own. It’s fairly easy to do. If you’d like to try to make some of your own, here they are, and the general idea for their construction. This one is made from leather, cut with scissors. The loop under the second toe is just a thin strip (thong) held on by those knots you see. The strap across the top a two short thongs. They are held together with a loop and knot arrangement (small loop on one side; knot on the other; pull the knot through the loop and it stays). This one is also leather, with a slightly different attachment arrangement, and a slightly different look. Same arrangement under the toe. This time, however, the large strip is the cross-strip, while the thong runs back towards the toe. 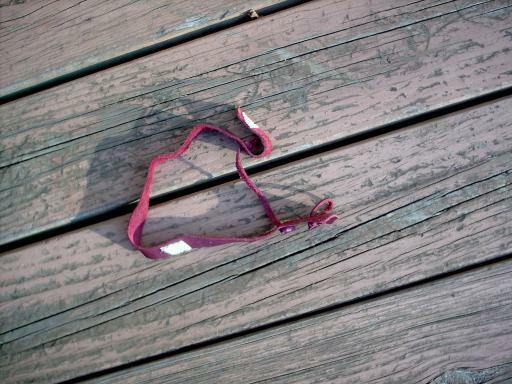 The thong is knotted on both end. The cross-strip, however, is attached with velco. You can see the construction in the next photo. Here you can see the toe-loop on the right. You can also see where the velcro is attached. Of course, sizing (and placement of the velcro) is done while it is on your foot. Here is a more masculine one. This is made from backpacking straps (available at any outdoor store). It is bigger and bulkier, with the intent to do a better job of fooling anybody who looks at it. That broader patch across the toes is kind of trying to hide the fact that the attachment is a loop under the second toe (and not a single piece between the big and 2nd toes. Doesn’t succeed all that well, in my opinion. The loop under the toe is just a piece of shoelace. The cross-piece is stitched on one side, and held on with velcro on the other. This is the one I think I like the best. 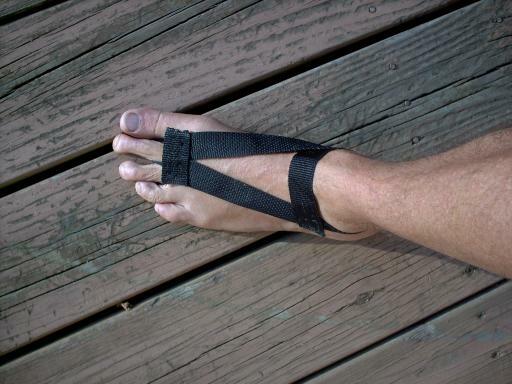 It goes easily into a pocket without getting tangled up like the others, and is easiest to put on (big loop behind the ankle, little loop under the toe). This was made with a knitting knobby. Well, actually, I made my own knitting knobby (with a board and nails) that would take a thicker piece of string, and produced a wider product at the end. I see that there is something call a knitting tower that is similar to what I did. The toe-loop is a piece of elastic string tied at the same place the big loop is tied together. This really does go down between the big and 2nd toes, and then is looped over the 3rd toe. This has more of the look of a flip-flop (and thereby might fool others better). Despite making all these, I find I rarely (I mean really rarely) wear them. If I am going into a place I’ve never been in before, I will not wear them. That is because, if I do wear them and have no problems, I’ll never know if I could have just gone barefoot and had no problems. They are not worth carrying in my pocket in case I am challenged. If I am challenged when barefoot, and stop to put them on, they will see me putting them on, realize that they are not real sandals, and then they will probably still throw me out. Finally, for places that do throw me out for going barefoot, my usual policy is not to got there again. If they don’t want me, why should I give them my money when there are other places who welcome me barefoot? So, as I said, I very rarely wear them. There is one kind of situation in which I will use (and have used) them, though. That is for a place that has thrown me out that I really, really need to enter (and they are often a monopoly of some sort). One was the Franklin County Law Library. I had used this library (research for my lawsuit) many times barefoot when suddenly they put up a sign (passed by their board of trustees and everything). So I put these on to go in. Interestingly, I got some books and was sitting down looking at them (kind of hiding in the rear of the room among the carrels) when I saw the librarian coming towards me to check me out. The barefoot sandals must have passed muster, because she looked at my feet (rather carefully) as she went by, and then continued on without hassling me. Now, maybe I fooled her. Or maybe she thought the shoe rule was stupid but was still required to enforce it, and while she recognized the barefoot sandals as not real shoes, that gave her the excuse she needed not to enforce the rule any further. Either way, it worked sufficiently. I’ve done this before at the Columbus Metropolitan Library (the one I lost my suit against) twice. Once I had to accompany my son there to get something, and once they were the only source I could use to get a copy of a newspaper article about the Youngstown barefoot lawsuit from the 1960s. That Youngstown barefooter won. I’m still a little leery about using them in places I’ve been thrown out of. If they really pursued it, they could probably arrest me for criminal trespass, and that I ought to know that a shoe rule means that such barefoot sandals are not adequate. Even if they ban “bare feet”, a prosecutor could argue that I am just being pedantic, and that a reasonable person knows what is required (a sole). Here’s what happens when you try to make a dog wear shoes. Babies often react the same way. The Living Barefoot site has done a wonderful interview with Cody Lundin (of recent Dual Survival fame) that I think everybody will enjoy. It was a bit different than many of the interviews he has done about the show simply because he is being asked the questions (that address the interests) of real barefooters. It is Episode 19 of their Living Barefoot Show. What he talks about will be pretty familiar with a wide range of barefooters. For one thing, he talks about whether he goes barefoot all of the time. His answer is basically, “Don’t be a jackass.” There are times he will wear shoes, such as when he is out on a date, or when he is with others who he does not want to be embarrassed if challenged. On the other hand (or is that “on the other foot”? ), sometimes he’s just not in the mood to put up with being restricted. So in those instances, he’ll challenge things. I find I do something similar myself. This discussion is around the 6:00 mark. He also mentions that he carries sandals in a fanny pack when conducting his survival course. This only makes good sense. As he puts it, he is out there responsible for his clients’ safety. If one of them gets hurt, he needs to be able to run to get help, and in that situation, sandals are the tools to get the job done. However, when I was leading Boy Scouts on a hike, I did carry a pair of moccasins even in the summer. Again, as for with Cody, I had a heightened responsibility. I actually did use them one time, not for an emergency, but just because some of the Scouts needed to be somewhere at a given time. So a few of us dashed ahead to get them home. In that case, I could go a lot faster in the moccasins. Two Mohave braves dressed in loincloths; full- length, standing, western Arizona.